Contabo is an Award Winning Internet Service Provider based in Munich, Germany. Contabo was founded in 2003, by self-confessed tech-enthusiasts, Michael Herpich and Michael Bölke. In the spring of 2003, there were many skeptics who said that there was no space for another web hosting company. At this time, Contabo went by the name “Giga-Hosting”. By sheer determination, and against all odds, Contabo grew rapidly and had tens of thousands of happy customers worldwide in the first 24 months. We had the opportunity to speak with Markus Heimerl, Head of Marketing at Contabo. Firstly we were interested to find out about why they chose Web Hosting as their niche. Markus told us “we realized from our own experience that people need cost-effective hosting solutions and figured that this demand will most likely increase over the years”. So when deciding to start their own business, over a decade ago, the founders of Contabo thought it only logical to create a hosting business with a “special focus on customer satisfaction and customer needs” Markus informed us. Contabo was established out of a love for tech, and to this day they continue to build on their knowledge to develop the company’s core products and services. As we have established, Contabo was created out of a passion for tech, with an aim to provide outstanding customer service. In our interview, we quickly learned that they have so far, delivered all that and so much more. We were keen to understand how Contabo actively provides outstanding customer service, and what measures they put in place to actualize their mission. On the main Contabo.de website, we found some really helpful and informative tutorials that allow customers (among other things) to navigate their VPS (Virtual Private Server) with ease. In addition to this, they have an active blog that has some great articles to keep customers up to date with any changes and upgrades. Contabo put their success down to their three pillars: Discount prices, Immediate service, and The customer is king. As well as offering standardized products, Contabo provides custom services to their clients. These are often in the form of add-on services, that you can apply with just one-click. We were very impressed to hear Markus tell us about this unique angle to hosting service provision. Markus told us that “you can always contact us with your special requirements”. It is unusual to hear hosting providers go to such lengths to deliver the best possible tailored service for their clients. Markus explained to us that “This especially applies to dedicated servers and colocation of servers: We will do our very best to offer you a customized solution”. Although at the time Contabo was founded there were plenty of other hosting companies, many with “powerful services”. Contabo was created with a specific aim to “Offer great customer support”. This has paid off in leaps and bounds, as the company has received countless awards. Markus proudly informed us: “Our support has been awarded several times over the last few years by the well-known German IT magazine CHIP and the research experts from Statista.” In fact, we have since learned that Contabo has been winning awards every year since 2014. Contabo offers four web hosting packages, to suit every website requirement. There is no setup fee with any of their services and all of their services come with Award Winning support (available 365 days of the year). Their hosting packages also offer a cPanel to administer your website, a homepage builder kit and unlimited traffic, as standard. 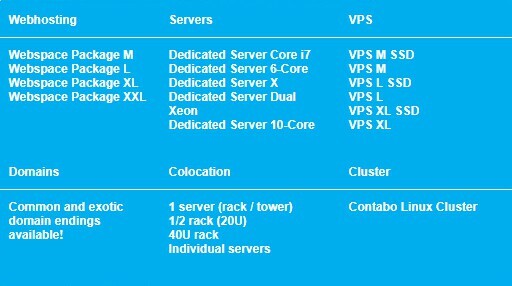 Below is an overview of the hosting services that they provide. Webspace Package M: This is an amazing starter package with a free domain, 50.00 GB of storage, SSL certificate, 20 MySQL databases , 1000 email address’, a host of additional one click additional features. Webspace Package L: With 2 free domains, 100.00 GB of storage, SSL certificates, 50 MySQL databases , 2000 email address’, a host of additional one click additional features. Webspace Package XL: 3 free domains, 250.00 GB of storage, SSL certificates, 1000 MySQL databases , 5000 email address’, a host of additional one click additional features. Webspace Package XXL: 5 free domains, 500.00 GB of storage, SSL certificates, Unlimited MySQL databases , Unlimited email address’, Unlimited ftp accounts. As well as a host of additional one click additional features. Available with all Contabo Webspace packages free of charge incl. In addition to this, there are a host of “One-Click” additional features that can be easily added to your website such as: guestbook, e-mail administration, calendar tools, database tools and music tools. This can enhance the features and functionality of any website. For the consummate professional, you can purchase VPS (Virtual Private Servers) or Dedicated Servers with up to 256GB of REG ECC RAM with custom upgrades, such as up to a 6000GB hard drive and 1 Gbps bandwidth. How does Contabo Stack Against the Competition? We must admit it! Contabo certainly does impress, with their comprehensive hosting packages and award winning customer services. If I were looking for a hosting provider in Germany then Contabo would be my first choice. We love the value for money that Contabo offers, with thousands of email addresses and homepage builders. There is something for everyone, from the complete beginner to the professional web developer. Although now successfully established among the larger companies and providing award-winning hosting services, Contabo still looks forward to what the future holds. As an established company, the staff at Contabo still thoroughly enjoy the fast-growing industry that they joined, as a start-up, over 15 years ago. Markus told us: “We are looking forward to all the upcoming developments regarding for example cloud services for both private and business customers”. We really enjoyed chatting with Markus and learning all about Contabo and look forward to their continued growth in the future.